Li-Fi market size was valued at USD 630 million in 2015, and is likely to grow at 80.8% CAGR from 2016 to 2023. Massive bandwidth in light of growing RF spectrum crunch coupled with high degree of security, availability, and energy efficiency is expected to drive the global Li-Fi market size. While visible light communications (VLC) market also includes a solid state emitting device and a photo sensitive receiver, VLC is a point-to-point light communication link; it is unidirectional and operated at low or moderate data rates. Li-Fi does not require line-of-sight between the transmitter and receiver. This technology offers high data transfer rates owing to presence of low interference as well as large bandwidth over the network. For instance, it is capable of delivering the same or greater data transfer speeds when compared to a Wi-Fi access point. Internet video traffic is forecast to grow at over 45% in the coming years, with video expected to contribute to nearly 70% of consumer internet traffic. Increasing data production and usage will lead towards the need for wireless optical networks alongside RF-based networks. Rising demand from environments such as hospitals, medical centers, and schools are likely to fuel the industry from 2016 to 2023. As this technology involves visible light wavelengths instead of radio waves, it is likely to nullify the negative impact on human health. It is similar to Free Space Optics (FSO) as it utilizes light to transmit data; however, companies operating in the ecosystem aim to produce a networked solution as opposed to point-to-point. 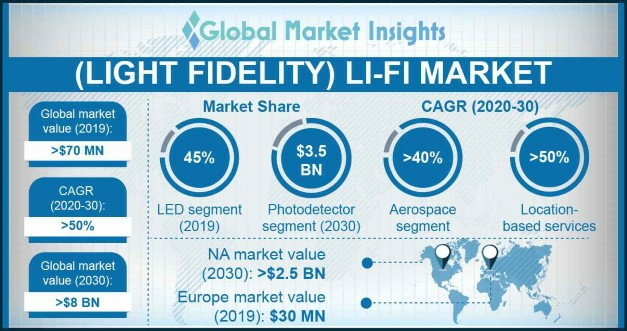 Rising LED adoption owing to benefits offered such as longer life span, high efficiency, and low maintenance will also aid in global Li-Fi market growth. Several nations such as the U.S., Japan and China have taken initiatives for energy conservation with the help of LED lighting technology. For instance, the government in China supports high brightness LED industry through incentives, financial subsidies, and resources to advance the manufacturing capabilities of domestic LED manufacturers. While the primary purpose of LED light is illumination, additional properties of electronic devices make them suitable for communications. Low degree of awareness regarding the technology may restrain growth in the coming years. Additionally, misconceptions such as the technology being line-of-sight in nature are expected to challenge growth. Industry experts predict the impact of this restraint to lessen over the forecast timeframe with growing consumer demand for wireless connectivity and higher data rates. LED is expected to exceed USD 33 billion by 2023, growing at over 79% CAGR from 2016 to 2023. Growing regulatory initiatives for energy efficiency has led to increased LED demand, which will drive industry growth in the coming years. Photodetector segment accounted for over 30% of the Li-Fi market share in 2015, and is estimated to be the fastest growing component. In the future, the technology can be integrated into a solar panel to create a self-powered receiver. The panel will receive light from the LED in order to create power, and will receive light from the network so as to act as the broadband receiver. This will open application avenues in rural broadband, backhaul, low-cost beacons, and the Internet of Things. Location based services accounted for over 40% of the global revenue in 2015, and is forecast to grow at 79.5% CAGR from 2016 to 2023. The technology is anticipated to enhance users’ shopping experience by providing precise location information services. In addition, it also allows pop-ups regarding the recent product offers going on in the store. This helps shop owners by generating a reminder regarding product supply shortage across the store. Healthcare sector is projected to arrive at over USD 2.6 billion by 2023. This application segment is expected to grow significantly owing to absence of electromagnetic radiation such as radio waves that poses no threat to patients’ health and helps in rendering safe environment in the hospital as well as healthcare facilities. The technology also enables better management as it helps share patient data across different departments at very high speed. Asia Pacific Li-Fi market size was valued at over USD 185 million in 2015. The regional growth will be fuelled by need for internet connectivity in underdeveloped countries. UAE Company Zero 1 has outlined plans to roll out Li-Fi service in Silicon Oasis in conjunction with their project partner du. U.S. Li-Fi market share is projected to grow at 78.0% CAGR from 2016 to 2023; it was valued at around USD 190 million in 2015. The European industry is an early adopter, characterized by considerable research and product development initiatives. High demand for wireless communications across sectors where Wi-Fi cannot be employed will drive growth over the forecast timeframe. Major industry participants include PureLifi, GE, Philips, Oledcomm, LVX, etc. These players are focusing on merger, acquisitions, and strategic collaborations to enhance their product portfolio. For instance, GE collaborated with Qualcomm to merge lighting and big data to transform retail experience in 2015. In the same year, LVX teamed up with NASA in order to introduce these products for space missions and to develop new application for VLC. Acuity Brands acquired Bytelight in 2015 with an aim to introduce precise indoor positioning technology for the retail sector. Later that year, it acquired Distech Controls for enhancing the lighting and control equipment portfolio.PureLifi and France-based Lucibel collaborated for developing and marketing a fully industrialized Li-Fi luminaire. A form of visible light communication (VLC) market, Li-Fi operates by turning off-the-shelf LED lights off and on within nanoseconds, which makes the subtle changes of brightness invisible to the human eye. Applying a constant current to an LED light bulb results in the emission of a constant photon stream; this is observed as visible light. Slowly varying the current causes the light’s output intensity to dim up and down. Since these LEDs are essentially semiconductor devices, the current and thus optical output can be rapidly modulated, which is detected and reconverted to an electrical current by a photodetector. Imperceptible intensity modulation results in seamless communication like that offered by RF.